Celebrating just north of Philadelphia at the Golden Gates Restaurant, Lauren and Mitchell’s wedding showcased a perfect mix of elegant and show stopping. Always masters of creation, Evantine Design created a glamorous scene that transferred from service to reception. With the white of the flowers and Lauren’s dress, the the decorations seem to glow in the lights of the reception. The always exemplary crew from Philip Gabriel Photography captured this sentiment with some beautiful moments in front of Philadelphia’s City Hall. Our partners always do a phenomenal job photographing the love between couples, an they surely did for Lauren and Mitchell. While our partners photographed the wedding, the Allure Films team captured the rest of the day on video for even more memories. After cutting the cake, the newlyweds and guests danced the night away thanks to Golden Gates’ band and dance floor. Our crew couldn’t have been luckier to capture this couple’s spark. Congratulations Lauren and Mitchell! We wish you a lifetime of laughter and happiness. Nothing beats a classic, romantic love story. From the charming wedding ceremony to a glamorous reception at The Bellevue in Center City Philadelphia, Michelle and Evan’s wedding perfectly encapsulated their story. Michelle didn’t realize their first movie together was a date, but Evan used his charm from day one to woo his bride-to-be. 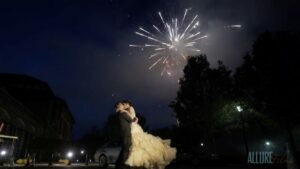 The spontaneous dates and immediate spark gave the couple an unbeatable connection that led to their romantic wedding day. Our friends at Lamsback Floral Decorations did an amazing job setting the perfect scene for the happy couple’s big day. The elegant chuppah added to the beauty of the touching ceremony. With such stunning scenery, it wasn’t hard for the Phillip Gabriel Photography crew to capture the day right alongside the Allure Films team. They did a great job photographing the couple and the joyful guests throughout the day. The pair seems to glow in their love at the ceremony, and that glow turns to electricity on the dance floor at the reception. Family members and friends watched the happy couple as they danced their first dance to celebrate their future together. To tug at our heartstrings more, Evan’s brother recounted a story about how Evan told him how lucky he is to have Michelle, from the very first day they met. Here’s to Michelle and Evan! There’s nothing like an Appleford Estate wedding! 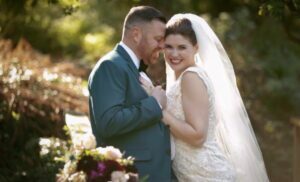 Just a few months ago, Anya and Russell said “I do” outside on the grounds of the picturesque arboretum, filled with boxwood gardens and blossoming trees. Anya happens to be part of the Philip Gabriel Photography team, so you can just imagine how ecstatic her coworkers were when Russell popped the question. If you have been keeping up with our blog, you know that the Allure Films crew is no stranger to working alongside our friends at Philip Gabriel Photography. To simply say we felt honored when Anya and Russell asked us to film their wedding, would be a complete understatement. For most brides, that short walk down the aisle with their father is a beautiful moment that goes by so fast but one they will never forget, and this definitely rings true for Anya. Anya was born in Ukraine and moved to the United States with her mother and brother when she was 10. The bride had only seen her father a total of three times since moving to America, and it meant the world to her to have her father present to give her away. Without a secured Visa, Anya was concerned that her father would not be able to be there for her big day. Alas, the stars aligned and Anya’s father was able to be there! Thanks to Sarah and her team from All About Events, Anya and Russell’s wedding day went off without a hitch on the day they got hitched! Petah Bashano was the visionary behind the couple’s wedding décor of beautiful and exotic dark teal floral arrangements. The talented performers of BVTLive’s Dream Time provided the beautiful music for the ceremony and cocktail hour that followed. Anya and Russell exchanged vows before friends and family in an interfaith ceremony officiated by Julie Cassidy, Owner and Wedding Officiant of Storied Celebrations. The celebration continued with a beautiful semi-outdoor reception consisting of a wonderful meal catered by John Serock Catering, and dancing, lots of dancing. DJ Steve Croce of Silver Sound Entertainment played amazing tunes throughout the evening. Anya’s boss Gabe, Philip Gabriel Photography’s owner, even put the camera down for a moment to bust a move! We know this was a day the couple will never forget. Anya and Russell, we wish you the best and this is only the beginning of a lifetime of happiness! Contact Allure Films today for more information about our comprehensive wedding videography packages. After being together for “four years, nine weeks, three days and 19 hours,” Meagan & Michael finally tied the knot before friends and family at the Union League of Philadelphia. Our filmmakers were there from the beginning to document the preparation before the ceremony, and the stunning footage kept rolling all the way to the end of the reception. 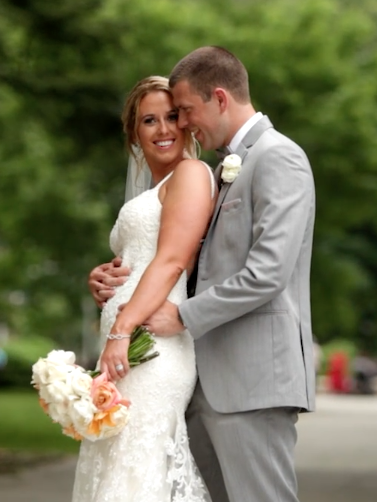 Our friends at Philip Gabriel Photography were there to get great shots of Meagan & Michael in front of City Hall and the Art Museum, along with indoor shots of the couple in the Union League’s Four-Diamond hotel The Inn. Michael’s son stood by his side serving as his father’s best man, while Meagan’s sister served as her Maid-of-Honor and walked her down the aisle. At the end of the night, Meagan & Michael – who are known as “M&M” – cut into an adorable wedding cake featuring a bride and groom M&M cartoon candy wedding topper. The newlyweds loved it just as much as their guests did! Congratulations Meagan & Michael, and may all your days, weeks, months and years together be filled with a tremendous amount of love! 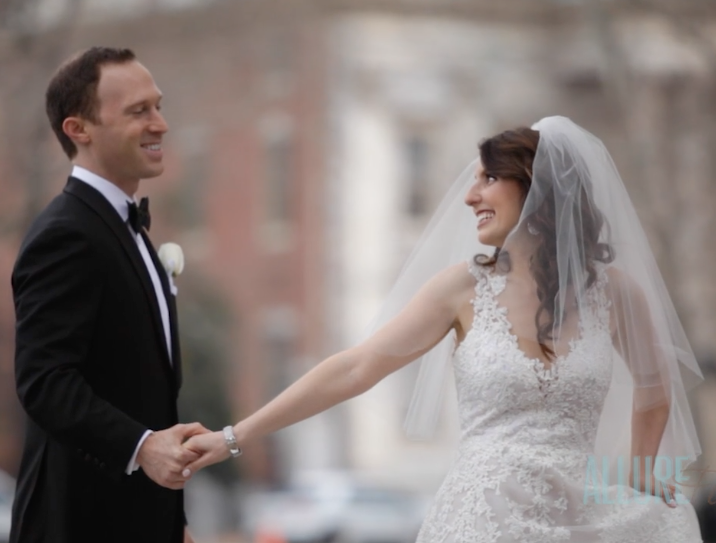 Thank you for allowing the Allure Films team to capture your stunning wedding at the Union League! Contact Allure Films for more information on our comprehensive wedding videography packages. Michal did not have to compete in the Olympics to get her gold; she met the love of her life – Daniel Gold – during their first semester at Temple University! These two finally made it official and tied the knot at the Springfield Country Club surrounded by friends and family, in a ceremony that far outshone anything you’ll see on an Olympic podium. Aside from wearing her own engagement ring, Michal also wore two other rings in honor of some very important women in her family: her Grandmother and Great-Grandmother. Michal wore her Grandmother’s wedding ring, along with a ring her Great-Grandmother was able to remarkably hide during the Holocaust at Auschwitz. This incredible piece of history has been kept within the family for decades, and Michal felt honored to wear it at her own wedding ceremony. Both the ceremony and reception were held within the venue’s Grand Ballroom. Philip Gabriel Photography took many romantic outdoor shots of just the couple surrounded by the country club’s lovely outdoor landscape. Evantine Design created the backdrop for the ceremony and reception with different floral arrangements and elegant candle décor. The reception was truly a celebration consisting of a great meal and a night of dancing to live music performed by EBE Paris. Mazel Tov Michal and Daniel! May the love and happiness you feel today shine throughout the years! Contact a representative from Allure Films about our comprehensive wedding videography packages. From Sweethearts To Husband & Wife! Morgan and Ben tied the knot in front of their friends and loved ones, who filled every pew of the stunning The National Shrine of Saint Rita’s of Cascia. It’s been a while since we’ve been to this gorgeous chapel, and it proved to be the perfect setting for the happy couple to exchange their vows. After saying “I Do”, Morgan and Ben led their guests up Broad Street to the Grand Ballroom of downtown Philadelphia’s iconic and historic Hyatt at the Bellevue. The Hyatt at the Bellevue is conveniently located in the heart of Philadelphia, on a section of Broad known as the Avenue of the Arts. Its convenient location allows for incredible photo and video opportunities, and Allure Films knows of several places nearby to get the perfect shot in front of some of the city’s most well-known landmarks. Lamsback Floral Decorators were the designers of the beautiful ivory floral arrangements that were the perfect compliment to the couple’s classic black and white style wedding. The couple’s wedding photographer, Philip Gabriel Photography, was able to get some fun and romantic shots of both the whole wedding party and just the couple themselves. The Eddie Bruce Orchestra provided the musical entertainment that had everyone dancing the night away! Congratulations Morgan and Ben, and here’s to continuing to build a beautiful life together!